This will bring up the Preferences dialogue box. 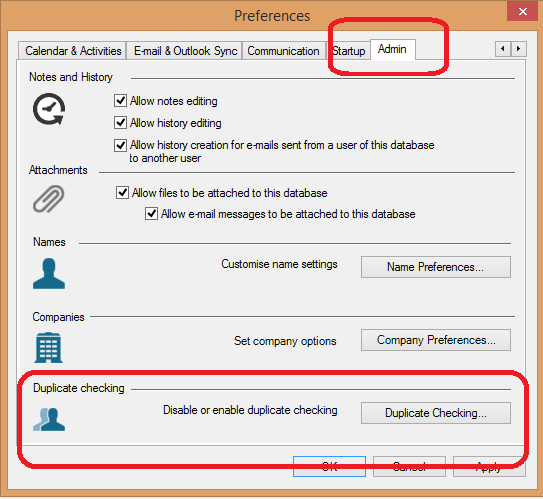 Within the Admin tab, click on Duplicate Checking. This will bring up the Duplicate Checking dialogue box where we can decide what our criteria is going to be for our database. 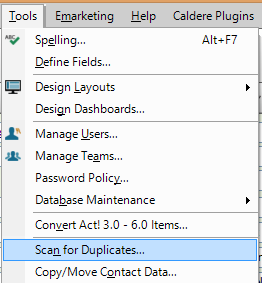 There are going to be cases where we want to scan our database for existing duplicates, and in some cases we may want the duplicate checking to be on fields different from the ones that are used by default when a new contact is created. 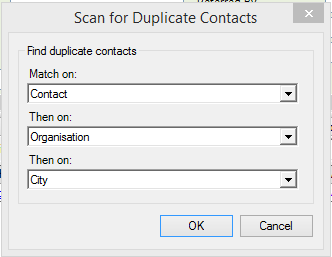 This will bring up the Scan for Duplicate Contact dialogue box. If duplicates are found then a list of contacts and a notice board will appear. Click Yes. 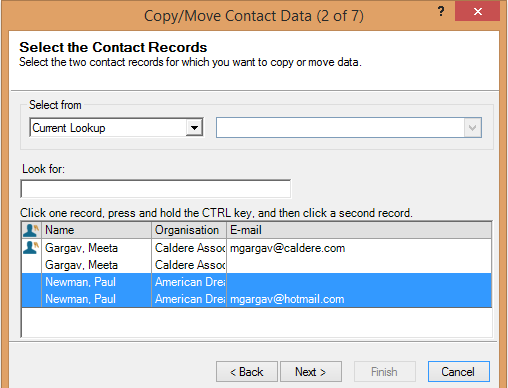 This will bring up the Copy/Move Contact Data dialogue box. Click Next. This will bring up the Copy/Move Contact Data (2 of 7) page. In the search results table, we can see the values that have been suggested as duplicates. Select the ones that you would like to merge and click Next. 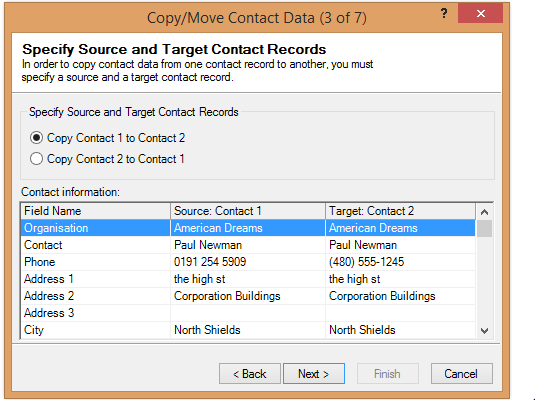 This will move us onto the Copy/Move Contact Data (3 of 7) – Specify Source and Target Contact Records dialogue box. Here we decide whether we are going to map data from Contact 1 to Contact 2, or the other way around. Choose the mapping direction and click Next. 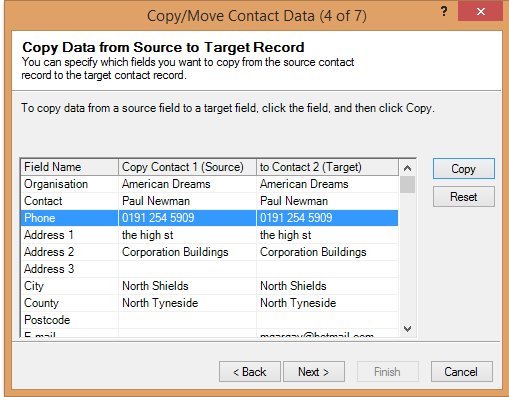 This will bring up the Copy/Move Contact Data (4 of 7) – Copy Data from Source to Target Record dialogue box. This allows us to choose which individual fields should be copied from the source record to the target record. Click Next. 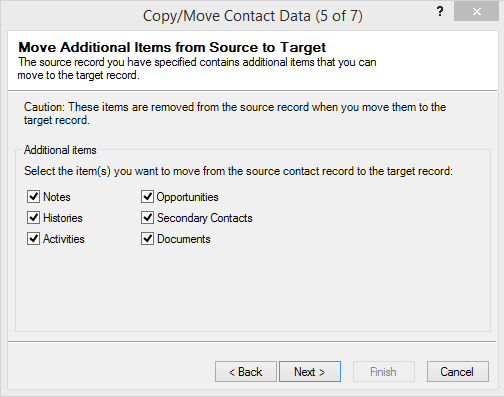 This will bring us to the Copy/Move Contact Data (5 of 7) – Move Additional Items dialogue box, where we can decide which additional items to move from the source contact card. Click Next. 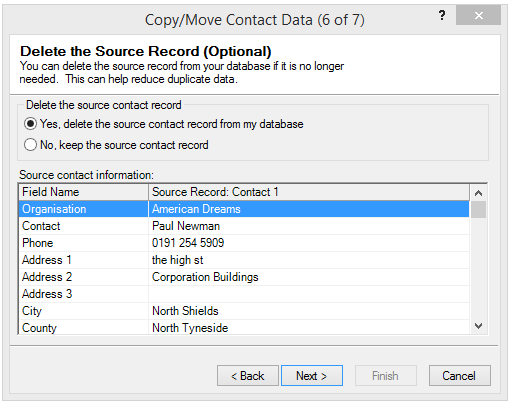 This will bring up the Copy/Move Contact Data (6 of 7) – Delete the Source Record (Optional) dialogue box. This screen allows us to either keep the source record card or delete it from our database. 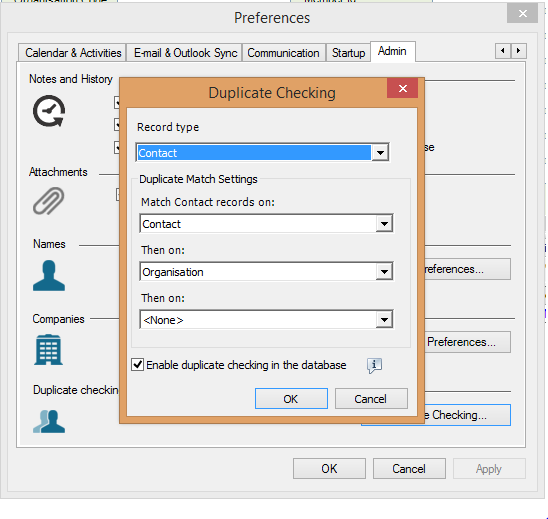 Assuming you have copied all of the necessary information from the Source record to the Target record, you can choose Yes to remove the duplicate. Click Next, then click Finish. The Wizard will work through the contact and will bring you back to the contact list view.